With the Paris agreement, all participating states committed themselves to significantly reduce their CO2 emissions in all sectors. Two options to reduce CO2 emissions from the energy and transport sector are renewable energy sources for electricity production and plug-in electric vehicles (PEVs). Both come along with a reduction promise, yet their development may cause some issues. On the one hand, renewable electricity generation depends on the weather and is, thus, very volatile. On the other, plug-in electric vehicles may cause electricity demand peaks if they are all charged at the same time. One option to cope with these challenges is coordinated load shifting (also: demand response). Then, vehicles are charged when enough (renewable) electricity is available. A common example is that a PEV driver arrives at home in the evening and starts charging his car directly on arrival. However, during this time electricity consumption is already high since appliances like the stove, TV, and washing machine are running. PEV charging could instead be shifted to periods with generally lower electricity demand, for example, during the night when wind potentials in the winter are the highest, especially in winter, or even during the next afternoon when solar power is produced. The idea is not new and has been studied in earlier research papers. Yet, on the one hand, these papers neglect the important early adopter group of commercial passenger cars which are registered by companies. Commercial users charge more often during the day and reduce the evening peaks with uncontrolled charging, while their load could even be shifted to night hours. On the other hand, different infrastructure options, i.e. at home, at work, and in public, are rarely differentiated in research papers. For example, additional charging at work or in public allows private users to charge during the day. Thus, both these aspects have an impact on the market diffusion of PEVs and on the shape of the electric load curves. To study the effect of additional charging options and the distinction between private and commercial cars on both market diffusion and load shifting potential, two models were combined. The first model simulates the market diffusion of PEVs with different charging infrastructure options. The second analyzes the load shifting potentials taking loads of other energy-demanding appliances and their impact on electric vehicle charging into consideration. 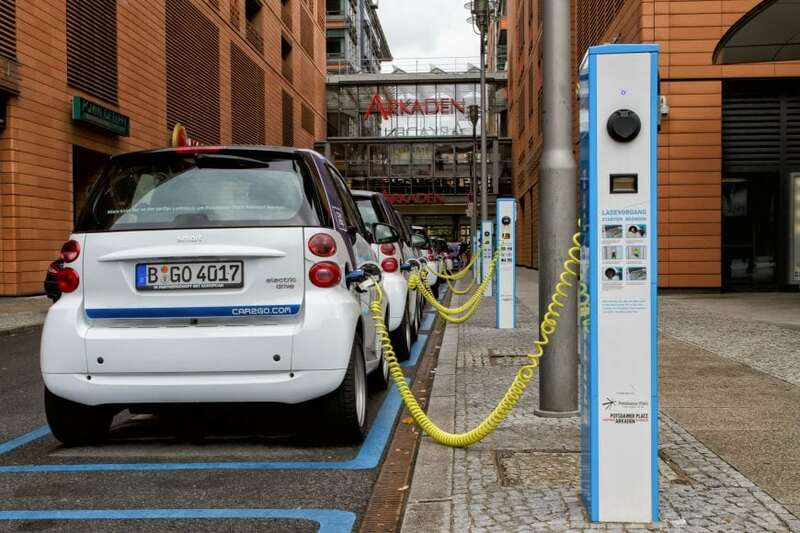 In a case study for Germany, three scenarios will be analyzed until 2030: one where only charging at home is available, the second one with additional charging at work, and a third scenario where charging at home, at work, and in public is allowed. The authors confirm the anticipated reduction of peak loads through commercial vehicles, which also reduces the load shifting necessity. Charging at work increases the number of PEVs and the load shifting options, while public slow charging has no further effect since vehicles are parked in public very rarely. If vehicles are only charged at home, an additional 1.6 TWh (24%) of surplus renewable excess electricity could be integrated. By also allowing charging at work, 1.8 TWh (30%) would be integratable, and the peak load could be reduced by 2.2 GW. The calculations show that both the consideration of commercial cars as well as different charging options have an impact on shiftable loads. In addition, renewable electricity producers and consumer would benefit from load shifting. These findings are described in the article entitled, The load shift potential of plug-in electric vehicles with different amounts of charging infrastructure, recently published in the Journal of Power Sources. This work was conducted by Till Gnann, Anna-Lena Klingler, and Matthias Kühnbach from the Fraunhofer Institute for Systems and Innovation Research ISI. Studies industrial engineering at the Karlsruhe Institute of Technology (KIT) (formerly University of Karlsruhe) and at the Politecnico di Milano (Italy). Overseas experience in Santa Clara, CA (USA). His dissertation examined the “technical and economic assessment of preconditioning electric vehicles“ at the Fraunhofer Institute for Systems and Innovation Research ISI. From April to December 2011 research associate in the Competence Center Energy Policy and Energy Systems, since January 2012 in the Competence Center Energy Technology and Energy Systems. He finished his PhD at the Karlsruhe Institute of Technology (KIT) in July 2015 on “Market diffusion of plug-in electric vehicles and their charging infrastructure”. In 2016, he spent a research semester at Argonne National Lab (Chicago, IL), Oak Ridge National Lab (Knoxville, TN) and the US Department of Energy (Washington, DC) to collaborate on the international market diffusion of plug-in electric vehicles. Studied industrial engineering with a focus on energy economics and energy technologies at the Karlsruhe Institute of Technology – including a semester abroad in Italy at the Università degli studi di Bergamo. Completed his Master in 2017 with a thesis “Carbon neutrality in buildings: Evaluation of alternatives using multi-objective decision analysis”. Since March 2017, scientific researcher at the Fraunhofer Institute for Systems and Innovation Research in the Competence Center Energy Technology and Energy Systems.